You are a bird hunting moths (both dark and light) that live on trees. As you capture the moths most easily visible against the tree surface, the moth populations change, illustrating the effects of natural selection. Perfect introduction to Natural Selection. 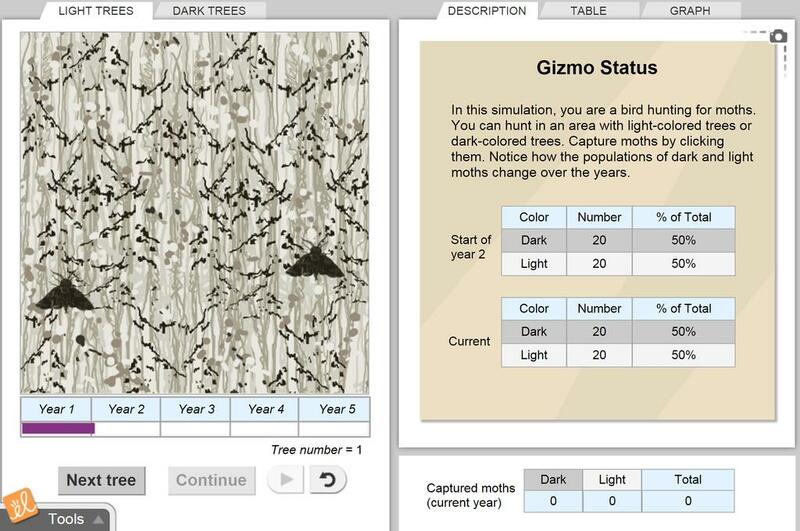 Because the kids try to eat the moths themselves, you get really rich data. Good for sample size! My students LOVED this! It turned an abstract concept into concrete. Great Gizmo - kids really enjoy it! Excellent for students to actually experience Natural Selection in an almost GAME format. This is a cool little gizmo that helps students see how natural selection works from a first hand point of view. Don't have your students hit the reset button after Activity A. This way they can compare results from the two colors of trees.